Marguerita Maria "Mady" Christians (January 19, 1892 – October 28, 1951) was an Austrian actress and naturalized US citizen who had a successful acting career in theatre and film in the United States until she was blacklisted during the McCarthy period. She was born on January 19, 1892 to Rudolph Christians, a well-known German actor, and his wife, Bertha. Her family moved to Berlin when she was one year old, and to New York City in 1912, where her father became the Irving Place Theatre's general manager. Five years later she returned to Europe to study under Max Reinhardt. She appeared in a number of European films prior to the early 1930s. In 1929, she starred in the first full sound film made in Germany It's You I Have Loved. In 1933, she toured the United States in a play called Marching By and was offered a Broadway contract the following year that allowed her, like a number of other German artists, to seek refuge from the Nazi regime in the United States. 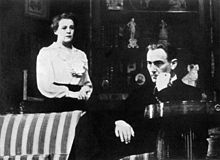 On Broadway, Christians played Queen Gertrude in Hamlet and Lady Percy in Henry IV, Part I, staged by director Margaret Webster. Webster was part of a small but influential group of lesbian producers, directors, and actors in theater (a group that included Eva Le Gallienne and Cheryl Crawford). Webster and Christians became close friends: according to Webster biographer Milly S. Barranger, it is likely that they also were lovers. She also starred in Lillian Hellman's Watch on the Rhine. She originated the title role in the 1944 play I Remember Mama. Her last movie roles were in All My Sons, based on the play by Arthur Miller, and Letter from an Unknown Woman, both released in 1948. During World War II, Christians was involved in political work on behalf of refugees, rights for workers (especially in theater and film), and Russian War relief, political efforts that would bring her to the attention of the Federal Bureau of Investigation (FBI) and other anti-communist institutions and organizations. In addition to her political work, Christians also publicly criticized the House Committee on Un-American Activities in early 1941 and likened the Senate Internal Security Subcommittee's investigation of propaganda in US film to Nazi harassment of film and radio artists in the 1930s. In 1950, the FBI's internal security division began investigating Christians, who had been identified as a "concealed communist" by a confidential informant. When Christians' name appeared in Red Channels, the so-called bible of the broadcast blacklist, her career was effectively over. ^ "Mady Christians profile". Encyclopedia.com. HighBeam Research, Inc. Retrieved January 15, 2015. Wikimedia Commons has media related to Mady Christians. Adele Sandrock was a German-Dutch actress. After a successful theatrical career, she became one of the first German movie stars. Emily Fitzroy was an English theatre and film actress who eventually became an American citizen. Werner Johannes Krauss was a German stage and film actor. Krauss dominated the German stage of the early 20th century. However, his participation in the antisemitic propaganda film Jud Süß and his collaboration with the Nazis made him a controversial figure. Frederic Zelnik was one of the most important producers-directors of the German silent cinema. Zelnik became a successful director and also producer of period operetta films in 1920s and 1930s. He also appeared on screen as an actor. Rosa Valetti, born Rosa Alice Vallentin, was a German actress, cabaret performer and singer. Harry Liedtke was a German film actor. Georg Jacoby was a German film director and screenwriter. Fritz Kampers was a German film actor. He appeared in 261 films between 1913 and 1950. Paul Biensfeldt (1869–1933) was a German-Jewish stage and film actor. Wilhelm Diegelmann was a German actor. Oskar Marion was an Austrian film actor.